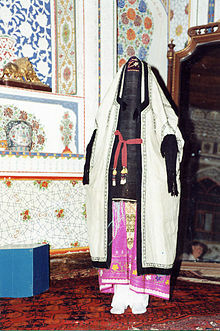 Paranja (or Paranji) from فرنجية (Паранджа) is a traditional Central Asian robe for women and girls that covers the head and body. It is also known as the "burqa" in other languages. It is similar in basic style and function to other regional styles such as the Afghan chadari. The chasmband and paranja were used by women to completely cover themselves in cities in Central Asia. In sedentary Central Asian Muslim areas (today Uzbekistan and Tajikistan), women wore veils which shrouded the entire face. These were called paranja or faranji. The traditional veil in Central Asia worn before modern times was the faranji. The part that covered the face, known as the chachvan (or chachvon), was heavy in weight and made from horsehair. It was especially prevalent among urban Uzbeks and Tajiks. The paranja was worn in Khorezm. It was also worn during the Shaybanids' rule (c.1510–1600). In the 1800s, women of the Tajiks and Uzbek Muslims were obliged to wear paranja when outside the home. Paranji and chachvon were by 1917 common among urban Uzbek women of the southern river basins. This was less frequently worn in the rural areas, and scarcely at all on the nomadic steppe. One historical account of the paranja is from Lord Curzon, who travelled to Bukhara in 1886. During his time there he never saw a woman between the ages of 10 and 50, for they were all concealed. The heavy black horsehair veils were "too bad and coarse for a seive", the women walking in loosely wrapped blue gowns with the empty sleeves pinned could have been "mistaken for clothes wandering about", and big leather boots covered their feet. Curzon noted that "Ladies of rank and good character never venture to show themselves in any public place or bazaar." He condemned this as a kind of tyranny, an exaggerated and erroneous notion of morality found everywhere in the East, but nowhere so striking as in Bukhara. Russia's October Revolution encouraged a liberation of women, and sought to discourage or ban the veil and the paranja. The unveiling by the Soviets was called the "hujum" in the Uzbek Soviet Socialist Republic (SSR). As the Soviet Communists secured their control of Central Asia, chachvans and paranjas were banned. The paranjas were burned on orders of the Communists. However, some veil-wearing Muslim women responded by killing the women who were sent to take their veils off. Some Uzbeks violently opposed the anti-paranja, anti-child marriage and anti-polygamy campaign which was started by the Soviet Union. Since the dissolution of the Soviet Union, Tajikistan President Emomali has claimed that veils were not part of Tajik culture. The veil was attacked by the government of Kyrgyz President Almazbek Atambayev. They are seldom worn now in Central Asia. ^ "Словник ісламізмів". Словник ісламізмів. Archived from the original on 11 March 2018. Retrieved 24 April 2018. ^ a b Ahmad Hasan Dani; Vadim Mikhaĭlovich Masson; Unesco (1 January 2003). History of Civilizations of Central Asia: Development in contrast : from the sixteenth to the mid-nineteenth century. UNESCO. pp. 357–. ISBN 978-92-3-103876-1. ^ a b Kamoludin Abdullaev; Shahram Akbarzaheh (27 April 2010). Historical Dictionary of Tajikistan. Scarecrow Press. pp. 129–. ISBN 978-0-8108-6061-2. ^ Krueger, Carolyn (2011). "Uzbek Dance A Short History". Gulistan Dance Theater. Archived from the original on 2016-10-24. ^ "Traditional Costume of Uzbek Women of the Late 19th and 20th Centuries Khorezm - San'at - Archive of San'at magazine". sanat.orexca.com. Archived from the original on 12 October 2017. Retrieved 24 April 2018. ^ "From the History of the Evolution of Uzbek National Costume - San'at - Archive of San'at magazine". sanat.orexca.com. Archived from the original on 17 February 2017. Retrieved 24 April 2018. ^ "Asian Muslim Women's Fashion History". www.aquila-style.com. Archived from the original on 18 August 2017. Retrieved 24 April 2018. ^ "Face veil, womens, (chachvan), looped construction, horsehair/ cotton, unknown maker (gypsy nomad woman), Russian Turkestan, c. 1900". www.powerhousemuseum.com. Archived from the original on 20 August 2016. Retrieved 24 April 2018. ^ "Bokhara - The forbidden city". eurasia.travel. Archived from the original on 10 May 2017. Retrieved 24 April 2018. ^ Craig Benjamin; Samuel N. C. Lieu (2002). Walls and Frontiers in Inner-Asian History: Proceedings from the Fourth Conference of the Australasian Society for Inner Asian Studies (A.S.I.A.S) : Macquarie University, November 18-19, 2000. Ancient History Documentary Research Centre, Macquarie University. ISBN 978-2-503-51326-3. ^ Eliakim Littell; Robert S. Littell (1889). Littell's Living Age. T.H. Carter & Company. pp. 438–. The Living Age. Littell, Son and Company. 1889. pp. 438–. The Fortnightly Review. Chapman and Hall. 1889. pp. 130–. The Fortnightly. Chapman and Hall. 1889. pp. 130–. ^ Ronald Grigor Suny; Terry Martin (29 November 2001). A State of Nations: Empire and Nation-Making in the Age of Lenin and Stalin. Oxford University Press. pp. 194–. ISBN 978-0-19-534935-1. ^ "Background: Women and Uzbek Nationhood". Human Rights Watch. Archived from the original on 2 November 2008. Retrieved 16 September 2010. ^ Hierman, Brent (January 20, 2016). "Citizenship in Soviet Uzbekistan". Dissertation Reviews. Archived from the original on December 1, 2016. ^ "Tajik womens paranja". www.powerhousemuseum.com. Archived from the original on 7 March 2016. Retrieved 24 April 2018. ^ Kamoludin Abdullaev; Shahram Akbarzaheh (27 April 2010). Historical Dictionary of Tajikistan. Scarecrow Press. pp. 381–. ISBN 978-0-8108-6061-2. ^ "Clothes of the Past". www.khiva.info. Archived from the original on 15 October 2017. Retrieved 24 April 2018. ^ "The untold story of Uzbekistan's dancer extraordinaire". www.aquila-style.com. Archived from the original on 18 August 2017. Retrieved 24 April 2018. ^ Pannier, Bruce (April 1, 2015). "Central Asia's Controversial Fashion Statements". Radio Free Europe Radio Liberty. Archived from the original on July 15, 2015. ^ "'Women in mini skirts don't become suicide bombers'". 13 August 2016. Archived from the original on 25 October 2017. Retrieved 24 April 2018 – via www.bbc.com. 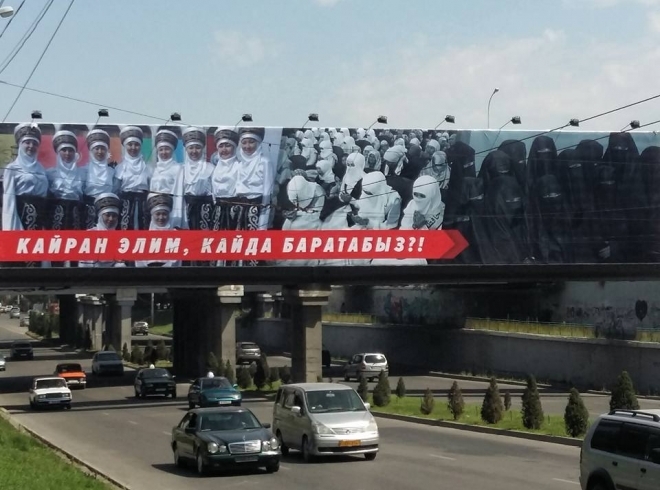 ^ "Kyrgyz Women Warned Of Dangers Of Islamic Dress". Archived from the original on 5 October 2016. Retrieved 24 April 2018 – via www.rferl.org. Lobacheva, N. P. (1997). "On the History of the Paranja". Anthropology & archeology of Eurasia: a journal of translations. Abingdon, Oxon: Routledge, Taylor & Francis. 36 (2): 63–90. ISSN 1061-1959. Northrop, Douglas (2001). "Nationalizing Backwardness: Gender, Empire, and Uzbek Identity". In Suny, Ronald Grigor; Martin, Terry (eds.). State of Nations: The Soviet State and Its Peoples. Oxford University Press. pp. 191–220. ISBN 978-1-234-56789-7. Northrop, Douglas (2003). Veiled Empire: Gender and Power in Stalinist Central Asia. Cornell University Press. ISBN 978-0801488917.